It was a memorable evening for us, members of the St. Sylvester's College OBA, President Mahesh Rajaratne and Kosala Gamage, to meet one of the finest sportsmen that St. Sylvester's has ever produced. Although he left the island over four decades ago, to settle down in Australia, he was so famous and made such impact during his school days as a boxer, even today the moment you mention his name the sports loving community and of course all Sylvestrians remember him with pride. I am referring to the best boxer St. Sylvester's has ever produced none other than brilliant, marvellous Malcolm Bulner. I met him in Negombo, just before he left after a short holiday, I was accompanied by another famous and a classy boxer during his era and his team mate in the Sri Lanka team Mohammed Jaroof. Malcolm Bulner is a unique boxer that this country has produced. His record is unmatchable. From the time he wore his gloves at St. Sylvester's and up to the time he migrated he was never beaten by any boxer in Sri Lanka. I don't think any boxer held this record. What is more significant is, as a schoolboy he passed many a milestones a boxer could achieve during his career. By the time he left College at the age of 20 he had already represented Sri Lanka at the Commonwealth Games in Perth, 1962 and Olympics in Tokyo, 1964 and also had beaten all the champions in his weight class in Sri Lanka and won many best boxer trophies. From the school ring to the national ring he graduated at the tender age of 18 and as a schoolboy he beat some of the veterans like P.C. Mahagedara, Hector Ekanayaka, L.V. Douglas, P.G. Neil and of course the famous Sumith Liyanage. His first fight with Sumith Liyanage who was a national champion and Olympic Boxer at that time was rates as one of the most memorable bouts in boxing history. Malcolm spoke about his opponents with respect. He said that P.C. Mahagedara, Hector Ekanayake were tough opponents and Sumith was the best. Bulner hit the headlines by beating Liyanage and represented Sri Lanka at the Commonwealth Games. He again met Liyanage on two occasions and beat him on both occasions clinched his place for the Tokyo Olympics in 1964. I have had the opportunity of speaking to both of them about their boxing careers. What Liyanage told me was the second bout at Bambalapitiya Boxing Stadium was one of his best bouts in his career. He fought like a stubb shield boxer from gong to gong continuously and at the end of the bout he thought that he had done enough to earn the decision. Malcolm stated that he was dropped for a mandatory count in the first round by Sumith, he only new that he had won the bout. When he was in the dressing room where his younger brother Michel was fanning him with a towel and our Guru Derrick Raymond standing by the side in a happy mood and informed him of the result of the bout. Malcolm went on to say that he could remember trying to avoid a right hand punch from Sumith and after that he could not remember any thing. The bout lasted the full distance and in the third round he had dropped Sumith Liyanage for a mandatory count and managed to get the decision in his favour. Later referee of that bout Hendricus had told Malcolm that it was one of the finest bouts that he had ever refereed and he had many anxious movements. Malcolm Bulner remembers all his opponents, sparring partners such as late A.C.R. Heratge, late Derrick Gunasinghe, D.C. Weerasinghe, D. Cooray, P. Edmond and many others. 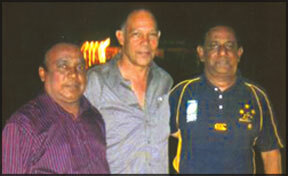 He spoke of the late Derrick Gunasinghe as an excellent sparring partner. When I posed the question to him has to how he achieved all these as a schoolboy his reply was: 'discipline'. He used to travel from Peradeniya to College by train and he trained under the able guidance of most respected boxing coach during our time Derrick Raymon and he never dissipated, during his career. He took lot of interest in every training session and that was the key to his success. Malcolm migrated to Australia in 1966 and continued his boxing career and won the Australian National Championship. He was selected to represent Australia in 1968 Mexican Olympics but it was very unfortunate that he lost that opportunity. There was a rule in Australia since he had represented another country he has to be a resident of Australia for three years to qualify. He was short of four months. But Australian government was prepared to bear all his expenses to the Olympics and they were prepared to permit him to represent Sri Lanka because Australians thought that he was a potential gold medallist. But it was so sad Sri Lankan authorities refused permission and balance his history. What an unfortunate end to brilliant amateur boxing career. Although Australia was trying to convince him to continue till the next Olympics in 1972, he decided otherwise and turned professional. He again won 20 bouts as a professional but he told me, due to a car accident he sustained a spinal injury which was worrying him and furthermore he has lost the desire which he had throughout his career to continue boxing. At present Malcolm Bulner is a WBA referee and had referred many professional bouts including heavyweight bout of former heavyweight champion Frank Bruno. Although many years have passed the name of Malcolm Bulner still rings a bell in Sri Lanka. This handsome, stylish, brilliant boxer will be remembered by every boxing fan in this country. Specially because of his brilliant style, power, and the ring craft, a boxer with a variety of combination of effective punchers. His record in the ring as a schoolboy boxer and as a sportsman will not be matched by any one in this century. What is unique in him is that he achieved everything as a boxer where he went on to represent his country at Commonwealth Games, Olympic Games as a schoolboy and up to that point, I don't think that any schoolboy had represented Sri Lanka at Olympics. Malcolm was here on a short holiday with his wife and he is such a humble person that he wanted his Australian wife to see where he lived, where he was educated and he told me that he visited their old house in Peradeniya and shown his wife where he lived and also has visited the college and take photographs of the ring that produced him and many brilliant boxers from St. Sylvester's. Jaroof and the writer were very happy to meet one of the most respected colleagues of ours who has not lost his common touch and remembers everything including his opponents with respect and gratitude and for Mahesh and Kosala the opportunity to meet their school days idol the marvellous, brilliant Sylvestrian boxer ever to grace the ring was a memorable one.